According to the US Bureau of Labor Statistics, the number of certified nursing assistants employed in the state of Washington, in May 2013, was 24,410. The average CNA salary in Virginia was $28,850 per annum and $13.87 per hour. Employment per 1000 jobs was about 8.63. As per the data of indeed.com, average nurse aide pay in WA was $25,000 per annum, as of January 2015. These figures were 3 percent higher as compared to the average salaries for job postings on a national scale. 90% of CNAs were offered less than $37,870; 10% were compensated more than $37,870. 75% of certified nurse assistants were provided less than $33,280; remaining 25% were salaried more than $33,280. 50% of the employees made less than $27,920; the rest 50% earned more than $27,920. 25% of CNAs were paid annual wages less than $23,520; 75% were paid more than $23,520. 10% of employees were waged less than $21,010; 90% were remunerated with an amount more than $21,010. There is not much variation in the salaries of certified nursing assistants in the various cities of Washington. The city providing the highest income is Bremerton with annual, monthly, weekly, and hourly salaries $33,225, $2,769, $639, and $16 respectively. Richland is the lowest paying city i.e. $29,312 annually. The median weekly salaries of CNA ranged from $564 to $639, and the per hour salary varied from $14 to $16. In the nursing field, the highest paid professionals, as per indeed.com, were CNA Hospice, who earned $33,000. They were followed by CNA Rrmc and Medical Assistant Family Practice, who were salaried $30,000 per annum. CNA Medical Surgical got $28,000 per annum. Of all, the lowest earners were Correctional Prison Facility CNA, who took home $15,000. The job outlook for certified nursing assistants is great in the forthcoming years. Since the population of senior citizens is growing in the state, the demand for nurse aides is likely to increase in the healthcare sector. The reports of Bureau of Labor Statistics indicate an increase of 21 percent in the upcoming years. Question 1 – Presently, I am working as a certified nursing assistant in the Olympia city of WA, but planning to move to Pasco city in a couple of months. Is there any salary difference in these cities? Answer – In both the cities, the median hourly salary of CNAs is equal i.e. $15, but the annual salaries provided in these cities vary slightly. The annual pay of nurse aides in Olympia ($31,633) is higher than Pasco ($30,394). 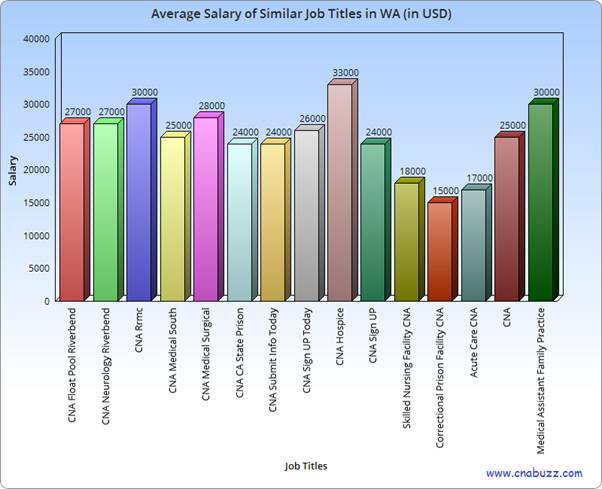 Question 2 – Can anyone tell me some highest paying job titles in the state of Washington? Answer – In Washington, the highest paying job titles include CNA Hospice ($33,000), Medical Assistant Family Practice ($30,000), CNA Rrmc ($30,000), and CNA Medical Surgical ($28,000).